Seaguar's new AbrazX Ice brand main line tested TWICE as abrasion resistant vs. leading competitor fluorocarbon lines. 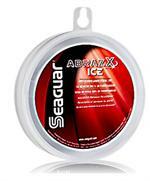 AbrazX Ice can be used in any Ice Reel. The line has exceptional knot and impact strength while remaining soft and sensitive in the coldest of fishing conditions. As with all 100% Fluorocarbon products, AbrazX Ice is much less visible underwater than monofilament line and virtually invisible to fish. The line is also high-density, UV resistant, chemical resistant, and non-absorbant. 06-AXI-50 6LB Test .008 in. Dia. 10-AXI-50 10LB Test .010 in. Dia.